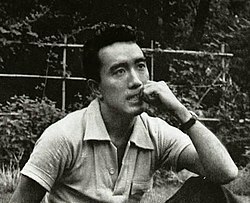 Yukio Mishima (三島 由紀夫, Mishima Yukio) is the pen name o Kimitake Hiraoka (平岡 公威, Hiraoka Kimitake, Januar 14, 1925 – November 25, 1970), a Japanese author, poet, playwricht, actor, an film director. Mishima is conseedered ane o the maist important Japanese authors o the 20t century. He wis conseedered for the Nobel Prize in Leeteratur in 1968 but the awaird went tae his kintraman Yasunari Kawabata. His wirks include the novels Confessions o a Mask an The Temple o the Gowden Pavilion, an the autobiografical essay Sun an Steel. His avant-garde wirk displayed a blendin o modren an tradeetional aesthetics that broke cultural boondaries, wi a focus on sexuality, daith, an poleetical chynge. Mishima wis active as a naitionalist an foondit his ain richt-weeng militia. He is remembered for his ritual suicide bi seppuku efter a failed coup d'état attempt, kent as the "Mishima Incident". ↑ Revealing the many masks of Mishima. The Japan Times. Retrieved on 2014-05-12. ↑ Yukio Mishima Essay – Mishima, Yukio. eNotes.com. Retrieved on 2014-05-12. This page wis last eeditit on 16 Mey 2018, at 06:55.